Some may say, “A toilet is just a toilet,” but there are actually many types, shapes, and sizes to suit different situations and spaces. Here at Beaverton Plumbing, we know that not all toilets are created equal, and we install and repair all types of toilets in both residential and commercial locations. When you are planning on remodeling or are undergoing new construction, and your plans include a bathroom, the toilet you choose is not something to take for granted. For adults, an elongated toilet is most comfortable. When space is at a premium, a round-front toilet is most desirable. Both types are available in styles that range from contemporary to traditional. Toilet height is also something to be considered. The standard toilet height measures approximately 14 1/2″ up from the floor to the bowl rim, not including the toilet seat. 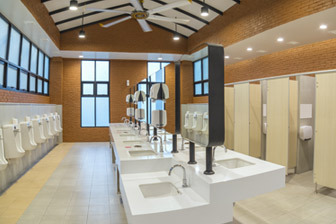 In recent years, however, toilets have become available in higher heights to accommodate taller individuals and to provide more comfort for seniors and those with physical handicaps. As a result, the most popular newer height is usually around 16 1/8″. Toilets that meet ADA (Americans with Disabilities) requirements now must have a floor-to-bowl height of 17″ to 19″, including the seat. Located near Portland, OR, Beaverton Plumbing will work with you to discuss your needs, preferences, and budget, and then help you select the most appropriate toilet model. We also can help you choose a toilet that meets US EPA standards for its WaterSense designation. Toilets displaying the WaterSense label use an average of 20% less water than their less-efficient counterparts and can save up to 11,000 gallons of water each year. By using high-performing, water-efficient products, we are helping protect our water supply and are educating our children in the importance of conservation for our future.